Supportive Care is the set of services focused on meeting the emotional, physical, social and spiritual needs of cancer patients and their families. These services may be needed and accessed at any time, from a cancer diagnosis to follow-up care. Supportive care can help people who are living with cancer and those who are coping with bereavement. 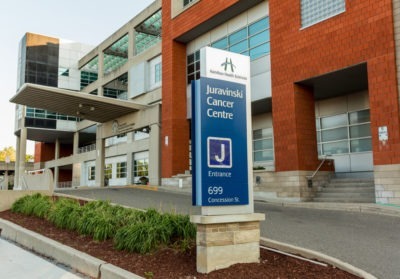 Supportive Care services are available to all patients at the Juravinski Cancer Centre. Our professionals will work with you, your family and your primary healthcare team to identify and respond to your supportive care needs. Social Work is focused on meeting the emotional, social, financial and practical needs of cancer patients and families. These services may be needed and accessed at any time, from the diagnosis of cancer through to follow up care. A referral to Social Work can be arranged through your Oncology Team or you can self-refer by calling Supportive Care at 905-387-9711 ext. 64315. The Pain and Symptom Management Team focus on helping you maximize your quality of life, when cure is no longer the goal of care. Patients may still be receiving chemotherapy, radiation, and participating in clinical trials. We are available Monday to Friday from 9 a.m. to 5 p.m. After hours, patients can contact the on-call team who will be able to access electronic notes and provide guidance based on the care plan established. If you have a pain and symptom management concern, please discuss this with your primary oncology team who can determine if a referral is appropriate. They will be able to refer you to our team. We provide a detailed clinical nutrition assessment based on your cancer diagnosis and care plan. This would include relevant past medical history (such as diabetes), medication use, weight history, blood work, social history, overall activity and functioning, nutrition impact symptoms and overall oral intake. We make recommendations regarding tube feedings, oral nutritional supplementation, symptom management, rehydration and medication review and advice.